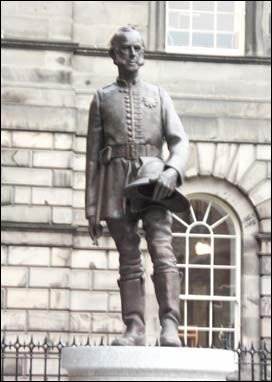 The James Braidwood Memorial statue, by Glasgow sculptor Kenneth Mackay, in Parliament Square, Edinburgh was unveiled by Professor Sir Timothy O'Shea, Principal of Edinburgh University on the 5th of September 2008. James Braidwood (1800–1861) was the founder of the world's first municipal fire service in Edinburgh in 1824, and was the first director of what was to become the London Fire Brigade. Born in Edinburgh, Braidwood trained as a cabinet-maker and builder before moving into fire-fighting. He died fighting the famous Tooley Street fire at Cotton’s Wharf in London on 22 June 1861 and his heroism was rewarded with what amounted to a State funeral in terms of public turnout. This statue is dedicated to the memory of James Braidwood, a pioneer of the scientific approach to fire-fighting. It also recognises the courage and sacrifice of fire-fighters, not only in Lothian & Borders Fire and Rescue Service, but all over the world.